They're no stranger to the world of New England style IPAs at Hope in the Hunter, having already put out a series of increasingly large hazy drops under a variety of Juicy names. Here, however, things are rather different, not least as it's something of an experimental collaboration with NSW based craft maltster Voyager and Hop Products Australia, the latter providing the as-yet-unreleased-commercially variety HPA-016. It looks rather different too, with black cans wrapped in bold black and white labels bearing a molecular structure. And it's also something of a rarity among beers of the style, built as it is with just a single malt and a single hop. 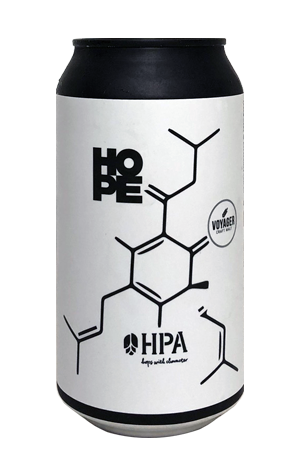 The former could be one reason why its haze is on the faint side, particularly when compared to some of Hope's other NEIPAs. As for the hop's contribution, check out what other brewers to have played with HPA-016 as a single hop and you'll find descriptors ranging from herbal, earthy and honey like to piney, citrusy and resinous. In this case, we picked out plenty of mango and a touch of paw paw, with perhaps even a hint of vanilla amid the creamy, soft maltiness and bitterness kept well restrained.